Brush eggplant slices with oil and place in a 9x13 baking dish. Bake for 20 minutes. Remove from oven but leave oven on. In a medium skillet, heat 2 tablespoons of olive oil over medium heat. Add onion, garlic, sun-dried tomatoes and zucchini and cook for 3-5 minutes. 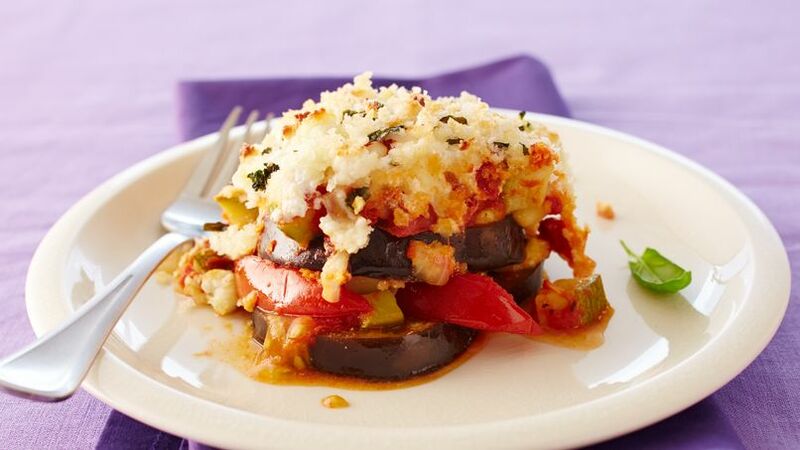 Layer tomato wedges over eggplant and add a layer of zucchini mixture over tomatoes. Add a third layer of marinara sauce over zucchini mixture. In a small bowl, mix goat cheese with mozzarella cheese. Layer cheese mixture over marinara sauce and sprinkle with basil, cotija cheese and panko crumbs. Baked uncovered for 30 minutes. Serve hot. Try adding different vegetables to the mixture for variety.